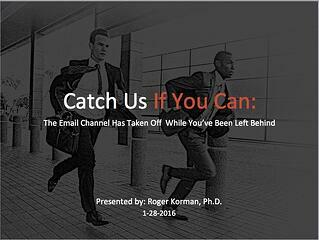 The email channel has taken off. Has healthcare been left behind? Listen to the webcast on the influence of email, and how healthcare can ramp up digital engagement with healthcare professionals, from physicians to mid-level prescribers. While the healthcare industry has been asleep, email marketing has become the leading influence of digital outreach. Industries from retail to travel to financial services continue to evolve email optimization strategies that engage audiences and drive transactions, leaving healthcare in the dust.